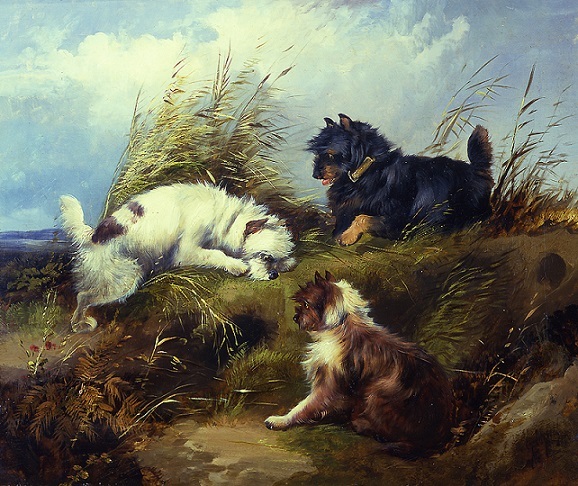 George Armfield Smith (1808-1893), also known as George Armfield was one of the best and proliferated dog painter of the nineteenth century. 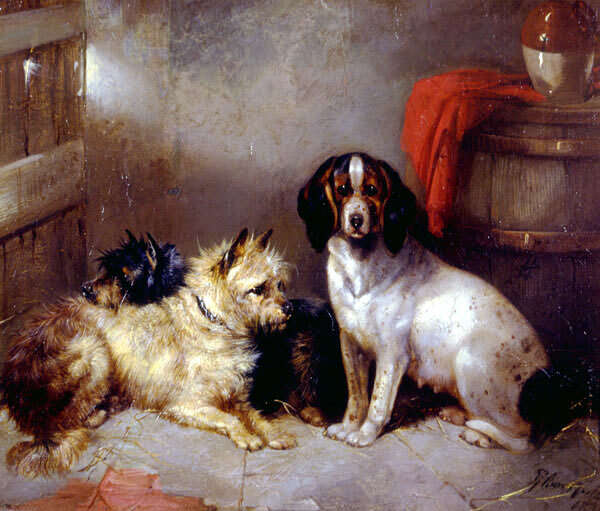 During this period, passion for domestic animals was increasing in England. The artist was hired to portray these animals and they instead received commission. 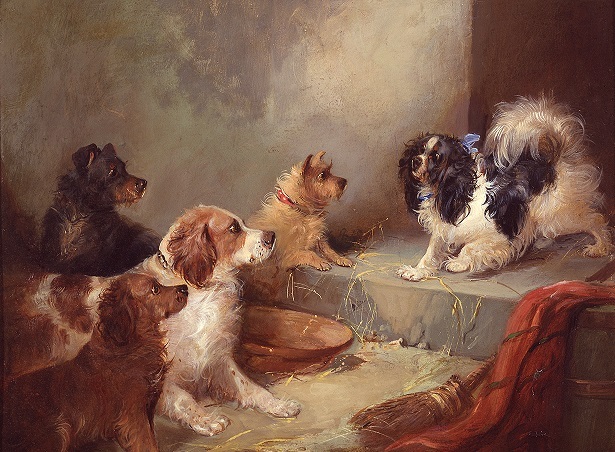 Although there were numbers of artists who painted animal pictures, only a few of them devoted their life for this pursuance and George Armfield was one of them. George Armfield was born in Bristol, London in 1808. He was born to a prominent painter father William Armfield Hobday, who made him learn the art of painting. His brother William Armfield was also a painter. Both the sons followed the footprints of his father and became renowned artists. George displayed his talent of painting at an early age but his father didn’t encourage him much and sent him in the making of fishing tackle as a newcomer. On the other hand, his brother was given education on arts and was sent to Rome for higher studies. But George also didn’t complete his apprenticeship in fisher tackle, and instead, by the age of 16, he dedicated his career to painting. He seemed to have to carry good fortune among the youth painters, as he showed no struggle period. He found his patrons in a short time, his works were also ready for sale type, and so his career as a painter was assured. He lived a comfortable livelihood, being able to make his name from his young age and sustain it. He married when he was 17 or 18, a dumb move though. His first marriage did not give him any child. He had a daughter from his second marriage and further twelve children were born from his third marriage. George was an ardent sportsman and also a well-known painter of subjects in sports. 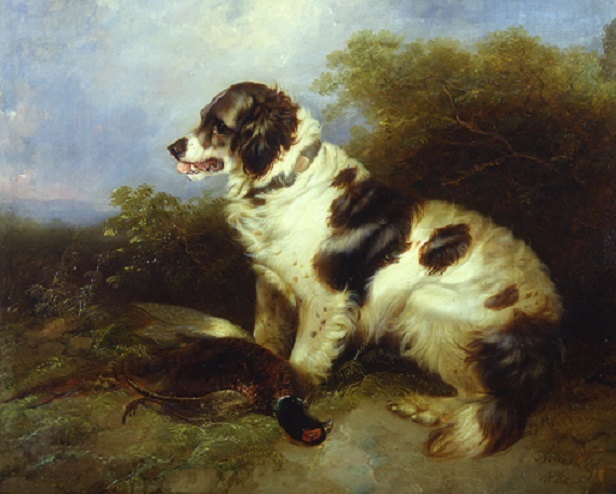 His first exhibition was at British Institution in 1839 where he depicted two pictures “Terrier Chasing a Rabbit “ and “The study of Dog’s Head”. In the beginning Stage he signed his paintings under the name of G A Smith, but later he omitted this and used his middle name and his first painting exhibition was under the name of George Armfield. After this, he became a regular contributor to Sporting Magazine. In the year 1840, Armfield became an exhibitor at the Royal Academy. Later his works were also displayed at the Royal Society of British Artists in Suffolk Street (RSBA). He continued his exhibition for more than twenty years. He exhibited 112 painting throughout his life out of which 37 at Royal Academy, 43 at British Institution and 42 of them at RSBA. Armfield Paintings were one of the finest on records. Mostly he painted portrays of dogs in oil painting, but he also painted horses, deer’s, foxes, otters and rabbits. He was acclaimed for his love for animals. He also kept a small collection of some of these animals in his house thus subjecting to live painting resulting in accuracy and perfect charm for his animal’s paintings. As he was an avid sportsman, he went for shooting, hunting and racing on regular basis. He was reputed as one of the finest horsemen to accompany while on fox hunting. He also loved the cockfights and dogfights and took a keen interest in them. He possessed a chestnut mare who had won many prizes and also a celebrated bull terrier Billy. George earned a hefty amount of money through his paintings but wasted mostly on gambling and race meetings. He provided some money to those people who were in need. He worked very hard and produced a lot of canvasses in such numbers that no one could compete in numbers of pictures of his terriers. Between the periods of 1840 to 1869, it was the golden period for George and he earned and produced a lot. By the year 1870, his eyesight failed and was admitted to the hospital for the surgery. The operation was not fully successful and he started to lose his eyesight further rapidly. Due to this he suffered from depression and tried to commit suicide. Later he overcame this depression and healed himself from his within wounds and started to paint again. But he was only able to paint with the help of powerful glasses on very small canvasses. The quality of paintings now were not up to the mark compared to his older versions. In his end life, he suffered from poverty to such an extent that The Royal Academy has to award him with a pension of 20 dollars per annum. He died in the year 1893 before withdrawing his first instalment. The theme of his father was continued by one of his children Edward who closely copied the style of his father but he did not succeed like George as he did not have that inborn talent.